A while back, Frankly Frugal asked me what I would do if I lost my wedding ring. I was able to answer with a good degree of certainty as it’s actually happened to me before. In a past marriage, I took off my ring at work. I put it in the safety of a zipped pocket of my bag so I wouldn’t lose it while on that particular job. The bag stayed within sight for the duration of the work day. Yet, at the end of it, the ring was gone. I turned the place upside down. I turned my car upside down. I turned my house upside down. I knew it wasn’t in the latter two places; it had definitely come with me to work and made it into that zipped pocket. But I had to look anyways. I never found the ring. I was devastated at first. But I eventually got over it. The ring isn’t important; the thing it symbolizes is. And seeing as that marriage ended in divorce anyways, I’ve more than come to terms with the loss of the jewelry. But what I did do as soon as I had accepted the ring wouldn’t show back up was file an insurance claim. Generally, wedding ring insurance is actually under a valuable personal property policy. You can insure the ring up to whatever it’s worth, and pay a premium based on the coverage level. My premiums for these policies have always been nominal (we’re talking less than $5/month,) and it turns out it was a really good policy to have. I lost the ring after the Recession had hit. It had been bought when the economy was booming. The value and therefore cost of precious metals generally goes down significantly when the economy is stable, and then shoots through the roof when the economy tanks. So my ex had gotten the ring for a comparatively affordable price. But when the market tanked, my ring went up in value significantly. As I was completing my claim, I realized this, but the only paperwork I had in regards to the value of the ring was the original receipt. Even though I had adjusted the coverage on my policy, they were only willing to pay out the ring’s documented value. So what happened? I lost upwards of $800. You can get an insurance appraisal at almost any jeweler’s. It’s not a complicated process, and they provide you with documentation of the ring’s value should you ever be unfortunate enough to lose that little band. Be aware that the ring’s value and what you would actually be able to sell it for are very different numbers. The value will be higher (and would be the amount your insurer would pay out should the unthinkable happen,) but no jeweler or pawn shop owner will give you that much for it. They’ll still give you more than what they would have when everyone had jobs and the value for precious metals was low, but they won’t give you the appraisal amount. At the end of the day, a piece of metal is just a piece of metal. It’s the strength of the relationship that matters. But if you’re properly insured, you can ensure that you can get the cash for a replacement piece of metal to pass on as a family heirloom if you so desire. 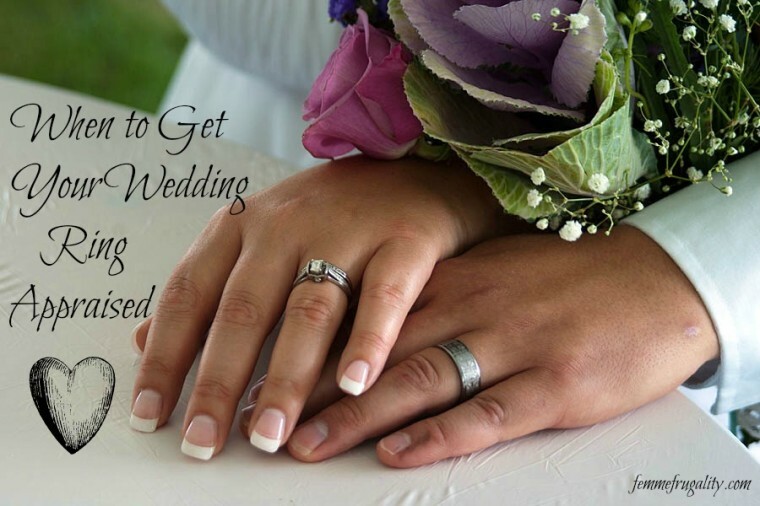 This entry was posted in Wedding on a Budget on November 12, 2014 by femmefrugality. If you can piggy back a policy onto one you already have such as auto, renters/homeowners, etc, the premium should be nominal. And you won’t have to depend on any more miracles. Because holy moly is that miraculous. We have a separate insurance policy for my engagement ring. The appraiser reminded us to get the ring evaluated every couple of years and update the insurance policy for the very reason you mention, price of gold and cost of inflation. I would never even have thought of doing this! But it makes sense. I have a bunch of my mom’s jewelry I inherited too, so I should probably get it all checked out. Thanks for keeping us smart and savvy, Femme! Definitely, definitely should. And thank you for the kind words, friend! Oh no! We went to the beach on ours and totally anticipated losing them, so we kept them at home. So sorry that happened! I’ve been very happy having that peace of mind, especially for the woman’s ring which is likely more expensive. Yikes. I might not have insurance on my ring at all, unless my partner took out a policy that I wasn’t aware of. Is it ridiculous that I never really thought about getting my ring insured? It’s not worth a ton, less than $1,000, but the sentimental value is through the roof, especially with the diamond being from his grandmother’s old ring. If only there were a way to insure sentiment! I’d still get a policy or, if it’s value is low enough for your budget, set up a separate savings account and save the value of the ring to self-insure. Gain some minimal interest. But still have it appraised should the value shoot up like mine did! Neither did I until it happened to me! It’s one of those things you wouldn’t naturally just think about. Related story —I do have a friend that was given a crazy huge diamond (3 carats i think?) and it was appraised at $30,000. It was a family heirloom and she could not afford to insure it so she gave it to another family member. Oh, wow! Yeah you’d definitely want that baby insured. At least it could stay in the family?